BVI, 5 dollars, 1979. Snowy egret. Gough Island, also known historically as Gonçalo Álvares (after the Portuguese explorer) or mistakenly as Diego Alvarez, is a volcanic island in the South Atlantic Ocean. It is a dependency of Tristan da Cunha and part of the British overseas territory of Saint Helena, Ascension and Tristan da Cunha. It is uninhabited except for the personnel of a weather station (usually six people) which the South African National Antarctic Programme has maintained continually on the island since 1956. It is one of the most remote places with a constant human presence. Since the "Gough Island" set is again a "circulation-like" set (that is, it is designed to look like a circulation set), you may wonder why an uninhabited island would need such a set. Presumably it is directed at those collectors who like to collect pieces from as many different countries and territories as possible. The set was planned and issued as an entirely commercial affair, as the population Tristan da Cunha, which is very small and not particularly rich, was apparently desperate to raise money for a hospital. Gough Island, although a dependency of Tristan da Cunha, is not politically organised, because it has no permanent indigenous residents. This is in contrast to, say, Alderney, which is an autonomous dependency of Guernsey, but is also populated and poltically organised, and issues its own collector issues but no circulation coins. In addition to all this, the Gough Island set contains both a crown and a 25 pence piece. The face value of a crown has traditionally been 25 pence (or 5 shillings in pre-decimal times), even though nowadays the UK 5 pounds coin is described as "crown-sized" (38.1mm in diameter). Furthermore, the sizes and shapes of these pieces do not correspond to those of their supposed UK counterparts. The set also lacks a 50 pence piece (unlike the official UK set) but includes a half penny, which was demonetised in the UK in 1984. 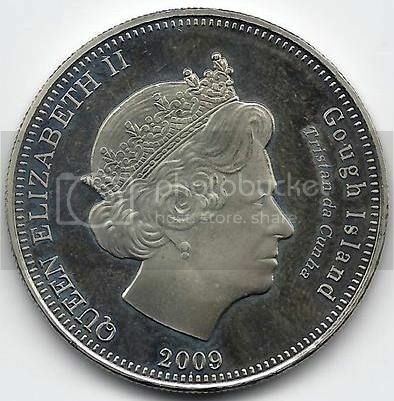 Common obverse of the Gough Island 2009 set: Elizabeth II. 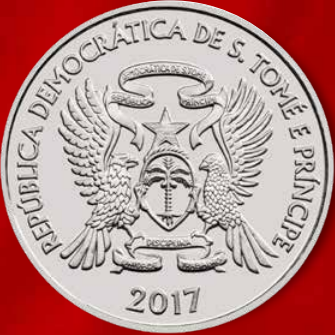 São Tomé e Príncipe, 2017.